Gems and Speed ups are the key point of this game. Then, how to get them faster and cost-effectively? The best way is to join a good guild where you can receive many high-quality gift chests. gems, speed ups, gear materials, VIP items, shields, energy, guild coins, resources, and actually almost everything. For one chest, it is an issue for your fortune, high chance you may get like 50 K resources. However, just imagine, if you can open 1000 chests? It will more or less be an issue of statistics+fortune. Where the chests come from? The chests have two types. package bonus: buy packages from the app store. Tips to maximize the output of chests. the firstly open chests (around 1000) have high chance to get gems. Leave these chances to high-quality gift, the common chest will destroy your fortune. 2, Guild gift level only influenced bonus chests. it is because bonus chests give more key to open big box. 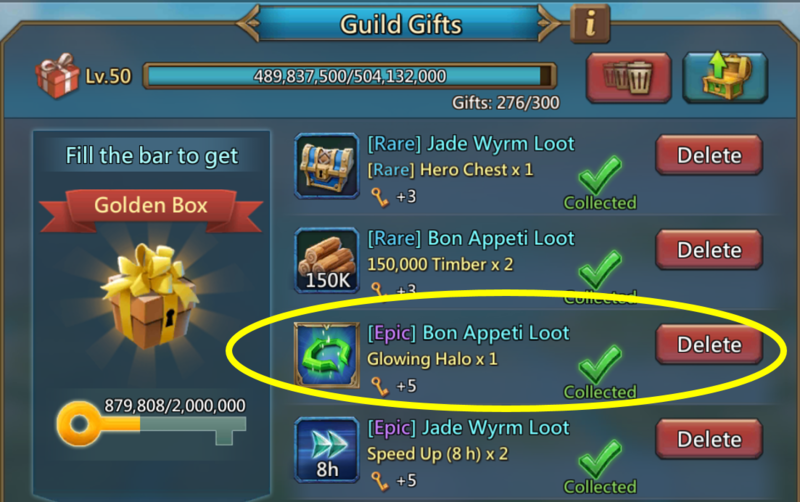 high guild gift level has more chance to get a golden box with good rewards. one extreme example is that level 60 guild, once the big box comes, it is sure to be a golden box. 3, Never hold too many chests. the maximum number of chests can be held is 300. if you remain 300 chests unopen, the newly come chests will replace the old one. the total number would not increase. Any questions could send the message to me. GOOD LUCK! Previous Previous post: Lords Mobile: Guild Fest, Here We Go Again? Next Next post: Migration Scroll: But 800k Guild Coins is a Lot!